Germany emerged victorious from the XIth Olympiad. Its athletes captured the most medals overall, and German hospitality and organization won the praises of visitors. Most newspaper accounts echoed a report in the New York Times that the Games put Germans "back in the fold of nations," and even made them "more human again." Some even found reason to hope that this peaceable interlude would endure. Only a few reporters, such as William Shirer, regarded the Berlin glitter as merely hiding a racist, militaristic regime. As the post-Games reports were filed, Hitler pressed on with grandiose plans for German expansion. These included taking over the Olympics forever. After plans collapsed to hold the 1940 Winter Games at St. Moritz, Switzerland, Hitler gained an unexpected opportunity to return the Olympics to Germany. In June 1939, Garmisch-Partenkirchen was again named to host the 1940 Winter Olympics. Claiming to have made the decision “regardless of political considerations,” the International Olympic Committee voted unanimously to return to Germany “in the interests of sport and the Olympic movement.” But Germany withdrew the invitation for the Games in November 1939, two months after it invaded Poland. In 1937, Hitler inspected architect Albert Speer's design for a stadium at Nuremberg that would host the Olympics for all time. 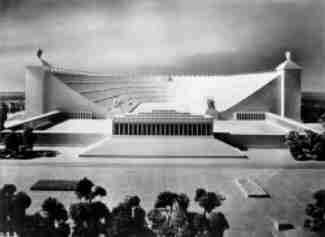 Speer's model for a colossal, 400,000-seat stadium satisfied the Führer's infatuation with monumental forms as a means of projecting German supremacy.